Thin plate rechargeable cells can solve many of the problems associated with "conventional" lead alloy batteries. The sealed constructions uses a patented, starved electrolyte system, providing numerous advantages including long service life, rugged constructions, extreme temperature performance, fast recharge, high discharge rates and low internal resistance. In addition to the standard cylindrical configurations, Cyclon cells offer a high degree of flexibility to meet unusual requirements and can be configured in an infinite number of designs to meet your precise voltage and amp hour requirements. 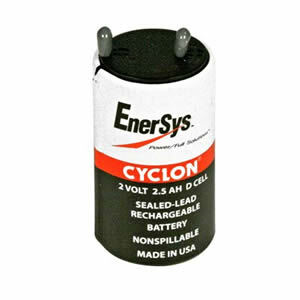 All Enersys Cyclon batteries feature: Capacity: 2.5Ah - 25Ah-Design life: 15 years @ 20?C (68?F). Design life of 15 years at 20ºC (68ºF) and UL recognized. Size: 1.35" dia. x 2.41"